Today’s guest is Esther Dorotik. I haven’t had the honor of meeting Esther in person, but from our interactions via the blogosphere, I know she is a woman full of grace. She loves the Lord, has a passion for His Word, and she is an encourager at heart. I love the beauty Esther has created on her blog, and her mission words resonate within me: “Chosen and Cherished, Encouragement for Living Life Abundantly.” Yes and Amen! 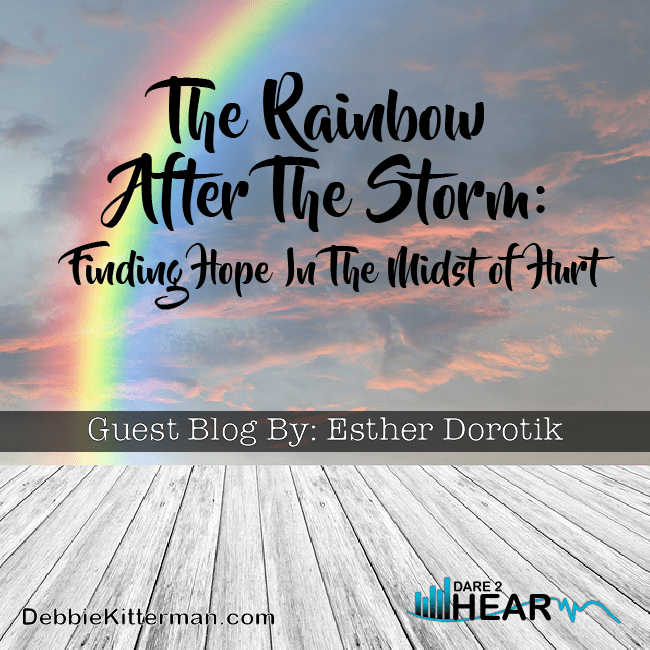 Thank you Esther, for sharing your hope and encouragement with us today at Tune In Thursday. I encourage you to leave comments below for Esther, and don’t forget to link up your posts below. Esther is a mama to two beautiful girls and a wife to an extremely supportive hubby. She’s a photographer and blogger. Most of her spare time is spent with her family or her nose in the Bible or a good book. The sun glistened on the fresh raindrops outside the car window. Partially dry windshield wipers screech across the window clearing the rain from the brief mid-June shower. As I lifted my heavy head from my hands and wiped the pool of tears from my eyes, there painted across the sky in the most brilliant colors, was a rainbow. A promise. A covenant signifying hope after the storm, beauty after devastation. Beauty, after this storm, Lord? Could there ever be? Nothing would bring my brother back. Not only was I mourning the loss of someone precious to me, but hopeless thoughts of his eternal home sank deep in my soul. Questions raced. Bargaining of “what if” and regret of “if only” stifled any strength I had left. How can anything beautiful come from such a tragic ending? A rainbow is a covenant promise signifying hope after the storm, beauty after devastation. While I will never understand why this or other tragedies have to happen, I now know a side of my Father I never knew before. My Merciful Helper showed up with unparalleled strength, matchless healing, and restoration of hope. Perhaps, you find yourself grieving the loss of a loved one, a miscarriage, a broken marriage, health, stability, or a dream. I’m here to assure you there is One who can take your wounded, weary, burdened soul and fill you with hope and joy in return. But what do you do while you travel through this valley of despair? How do you get to the other side when you feel like you’re surrounded by nothing but lifeless, dry bones? Grieve. Receive. Believe. And Agree. Grieving is a natural response to loss and there is no right or wrong way. The point is to give yourself permission to do so; not to ignore or suppress your feelings. Roller coaster emotions are common: there will be good days and indeed hard days. Sow, scatter, shed your tears. However, whenever, wherever and with whoever. Those who sow with tears will reap with songs of joy. He who goes out weeping, carrying seed to sow, will return with songs of joy, carrying sheaves with him (Psalm 126:5-6 NIV). Grieving is a natural response to loss and there is no right or wrong way. Notice, the person goes out weeping BUT still carrying seed to sow. We must be willing to do our part in the healing process. In addition to seeking God, this may include talking to friends, church family, or counseling. As an introvert, all I wanted to do was retreat, avoiding any contact with the outside world. But, isolation only makes you vulnerable to enemy invasion. As hard as it seems, keep living. Go out weeping and you WILL return with songs of joy, carrying sheaves of healing with you. Two people are better off than one, for they can help each other succeed. If one person falls, the other can reach out and help. But someone who falls alone is in real trouble (Ecclesiastes 4:9-10 NIV). The person goes out weeping BUT still carrying seed to sow. When you’re in the midst of grief’s valley and all you see are the mountains of despair hovering over you, it’s hard to believe there will be better days. Psalm 23:4 says, Even though I walk through the valley of the shadow of death…” Walk through the valley but don’t get stuck there. Don’t stop and build a tent along grief’s journey. It’s been a little over two years since my brother’s death and not a day goes by that I don’t think of him, but the sorrow that gripped me has diminished. This might go without saying but God speaks most through His Word. When you need to hear His comforting voice, dig into His love letter to you. I can’t tell you how many times God met me on the pages of Psalms. During the darkest time of my grieving, when I couldn’t see my hand in front of my face, Psalm 119:105 became my lifeline verse. His word gave me just enough light to see each next step, guiding me through the valley and onto healing. If you don’t know where to start, the book of Psalms is a great place. For a child of God, suffering is never wasted. If we allow Him to use our pain, He can bring good out of our. God can multiply seeds and return them a thousand fold like sheaves. Only your Redeemer can wipe every tear from your eyes and return what the enemy has stolen. Be patient. Waiting on the Lord’s timing and not leaning on your own understanding, is a test of trust. Just like a farmer who sows seeds and waits to carry sheaves, we too must wait on the Lord to renew our strength and replace our joy. He will give us wings to soar above the circumstances and to run the season without growing weary (Isaiah 40:31). There is a gift of understanding that comes from sharing your story with others. An understanding that you’re not alone in your suffering, your feelings, your fears, or your thoughts because others are traveling the same journey to find hope and healing. So, allow your pain to bring healing to someone else. What if you’re not the one going through the grief? What can you do for others? All examples of what NOT to say. Simply put, perfect words don’t exist. Being there to mourn with them (Romans 12:15), lending a shoulder to cry on, and a listening ear are great nonverbal ways declaring, “I’m here for you.” Although the story of Job’s friends (Job 2:11-13) didn’t end well, they had a great beginning. They sat by his side for a week allowing tears to say what words could not. So, be quick to listen and slow to speak (James 1:10). People offer with good intentions but it puts the burden of reaching out for help on an already burdened individual. Many times, the grieving have clouded vision and might not recognize the daily needs much less know when to reach out. According to Galatians 6:2, we are to carry each other’s burdens. Pick up the kids, grab groceries, drop off meals, or clean the house. Will my life ever be the same? No. There will always be birthdays without candles and holidays with an empty chair. But we can move past the empty hole of sorrow, finding hope for tomorrow and joy for our heart. We can move past the empty hole of sorrow & find #Hope. This was my theme today as I wrote in my voice. Wow, so much wisdom here, not only for the grieving, but for those who want to come alongside in support. Thanks, Esther! And thanks, Debbie, for this great summer line up! Thank you so much, Michele! You’re always an encouragement! You are most welcome Michele – this summer guest series has been fun, and we have a some more for September. Stay tuned! Thank you for sharing your very personal story and sharing that there is, indeed, hope in our grieving. I like how you point out that we need to allow ourselves to grieve, but not to camp out there as the enemy seeks to isolate us. Being in God’s Word and drawing close to Him have been my saving grace in times of grief. And yes, He does bring us THROUGH the valley. He doesn’t leave us stuck there. Beautiful and hope-filled post! Bev, Thank you so much! I am so grateful we serve a God who doesn’t leave us stuck in the desert but comes alongside and carries us to green pastures. We serve a Good God!! Bev – I too liked the part where Esther shared that we need to not camp out and become isolated in our grieving. It is such a plan of the enemy to do that. Grieving is a natural part of life, but we need to turn to God and allow others in as well. Blessings and thanks for being here today. Tragic deaths oft times bring unbecoming behavior – our family has suffered heinous fatalities by the hands of evil and through these incidents I have learned the very best ministry one can offer? Is the ministry of presence. Be there, words aren’t even necessary, just be there. Susan, I am beyond sorry for the loss you’ve experienced in your family. Death is never easy but tragedy brings an entirely new level of mourning. Just being there is so powerful. Some words can bring about more hurting than healing. Blessings to you and your family!! Esther, I love how you brought out ” the person goes out weeping BUT still carrying seed to sow.” Beautiful applications and hope. Thank you so much, Debbie! That was a lesson God laid on my heart in the midst of the storm. I had to be willing to do my part in the healing processes. For me, it was a surrender of not understanding the why. Debbie – wasn’t that such a beautiful picture, that life and growth can still endure in the midst of seasons of sorrow! thank you for being here today. Esther, your words spoke directly to my heart. I lost my youngest brother (who was just 30) tragically last year, and the grief and unanswered questions nearly stifled me. But God has shown Himself to be ever present, ever faithful and ever loving, and for that I’m grateful. Thanks for sharing your wisdom and practical advice. Your story gives hope to others. May God continually hold you close. Oh Carlie, I am so sorry for the loss of your brother! The unanswered questions gripped me too, friend. I once read a quote by CS Lewis that says something like “God whispers in our pleasures but shouts in our suffering.” It’s in those valleys He’s “shouting” His love for us. I’m so glad it spoke to you, Carlie! May God continue to show you His ever present faith and love to you…hugs!! This was so great, because I don’t know anyone who hasn’t been touched by grief, in some way! Thank you, Lisa! Grief will always be a part of this fallen world. It’s a reminder that this is not our home but we get to look forward to a home where every tear will be wiped away. Amen, Rebecca! I’ve seen both sides. A heart turned cold and angry because it did not grieve as well as a heart that became consumed with the grief. If not dealt with, grief can become a stonghold keeping us from the promised land of deliverance. Thank you for letting me guest post, Debbie! Thank you so much Esther. We all have times of grieving in our lives and your words are so helpful to bring us through to the other side. Thanks to Debbie also for inviting Esther to share. Thank you so much, Patti! We all definitely have times of mourning and I know the Father wants to meet us in those deep areas. Yes, thank you Debbie! Patti – you are most welcome, it was my honor and such a blessing to have Esther here sharing this week. Such a timely post for those living in south Texas – grieving over losses sustained from Hurricane Harvey. But as you say – God does bring good out of tragedy. I have witnessed so many people so willing to help others no matter the race, color or creed! Amen, Roseann and Debbie! God knew well in advance what needed to be posted and when. Isn’t it amazing that our Great Creator longs to minister and heal those hurting. Roseann, I love that you pointed out the willingness of others to help. May they see God through the loving hands of others! What a lovely post and great lessons to learn. Thanks for hosting and have a wonderful weekend. Great wisdom here, Esther! It’s always nerve-wracking what to say when someone loses a loved one. You offered wonderful tips too! I’m so sorry for you loss! Whoops, hit submit too soon. Since my brother’s death, I’ve learned to ask them to tell me about their loved ones, just listen, and mourn with them. Important truths for us to remember whether we are the one grieving or comforting a grieving friend. Thanks for sharing Esther and for hosting, Debbie. Donna – you are welcome and thanks for being here. Esther did bring us some great truths today! So beautifully written. God does show up in our storms. He will rescue us. I love the thought that even as we weep, we must carry seeds of change and hope. Thanks for your wonderful words. Mary – I loved that line in Esther’s post as well. I am so glad you were able to stop in today, and I completely agree – Esther’s post is beautifully written. Thank you so much, Mary! He absolutely seeks and rescues us!